My kids are forever keeping little stashes of things that they collect that Mom Must Not Throw Away. Under any circumstances. This makes it rather hard to keep any order in my house, and honestly, order is not a forte of mine, diligently as I try. Luckily for me, I requested — and got — a label maker for Christmas several years ago. My Mother-in-law laughed and laughed at me (in a nice way), but this has been one of my all-time favorite possessions. Sick, I know. The jars are the same spice jars I used for my snow globe adventure. If you’ve got a Cost Plus near you, they’re only 99 cents each (I couldn’t find these jars in their online marketplace…). Not too terribly spendy. Ouch! That’s so cute it hurts!! I love that little hand :-) My kids are the same way, but with papers. HUGE SIGH. I am a recycling addict and a decluttering queen, so I am always at odds with the huge piles of papers. And my son always knows when one little piece is missing. ARG! I’m a jar nut, too. I always get ticked when my husband does dishes and tosses the glass jars into the recycling basket! 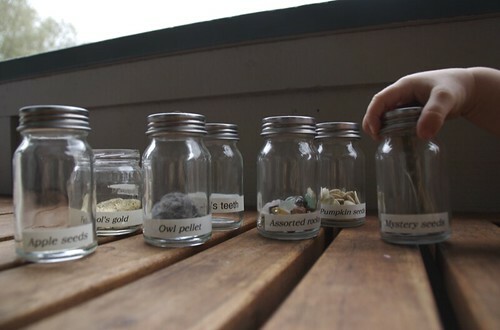 I have a jar for beach glass, one for pretty pebbles, another for shells, assorted jars for US change, pennies, International change, pens, individual wet wipes, old batteries, new batteries, fortune cookie fortunes, treasures my son and I find on walks like feathers and acorns, Splenda packets for my tea, chestnuts…. I often get vintage green glass canning jars and regular canning jars at the Value Village for $1, or less sometimes. I haven’t begun labelling them yet. I did buy a labeller a few years ago on eBay that I’m in love with (Brother P-Touch). I used that to label my collection fo vintage bulk goods tins (raisins, oatmeal, brown sugar, candy, goldfish…). While the whole process is a lot like pack-rat-ism, to messy old me, it’s part of my attempts to organize. Odd how something as innocuous as spending a bit of random blog time can unlock a whole panorama of memories…. Your mention of kids “collecting things” that mom ought not throw away put me in mind of the time that my mother DID throw away something in a jar that was dearly precious to me (although abhorrent to her). When I discovered the violation of being separated from my treasure I was mortified, bereft, inconsolable about it for many days…. What was this precious item you may ask? It was my tonsils. True enough. When I had my tonsils removed at age seven I had some weird obsession with not wanting the doctor to throw away a piece of me into the garbage. So somehow I cried, conned and cajoled him into letting me take them home with me in a jar of alcohol even though such nonsense was clearly in violation of hospital policy. They were rather disgusting looking things, but I had them sitting a top my dresser with great pride for many days until the fated horror or unthinkable horrors happened when my mom pitched them in the trash one day while I was at school. Okay – I almost lost my banana at the mention of Belladonna keeping her tonsils. EW! Pendullum: The hunt is on to figure out that mystery! this is such a fabulous idea…of course i don’t have the fancy label-maker, but still–what a good idea for a little order. i’m all about that!